In this review we feature the best Bluetooth motorcycle helmets that provide fully integrated Bluetooth functionality for taking hands free calls or listening to music. These helmets are specially designed for motorcyclists to take calls or listen to FM radio stations safely without distraction. Some of these Bluetooth motorcycle helmets also comes with DSP echo cancellation and noise suppression technology which allows you to take crystal clear calls while reducing background ambient noise. These helmets also come with built-in battery that provides hours of continuous playtime on a single charge with built-in speakers and full stereo sound. If you are looking for a Bluetooth motorcycle helmet to hit the road, be sure to check out our top picks below! The ILM Bluetooth Helmet is a motorcycle helmet that allows the user to communicate and listen to music using its Bluetooth 3.0 Technology and integrated speakers. It features two high quality built-in speakers that deliver premium quality stereo sound. Its battery life allows for 8 hours of talk time and 110 hours of standby. The helmet features fully washable microfiber liner and adjustable vents. It has sleek and modern looking design, and it comes in matte black color. This Bluetooth motorcycle helmet comes with an one-touch control for calling, answering, rejecting incoming calls and redialing in order to make these functions easy for the driver. 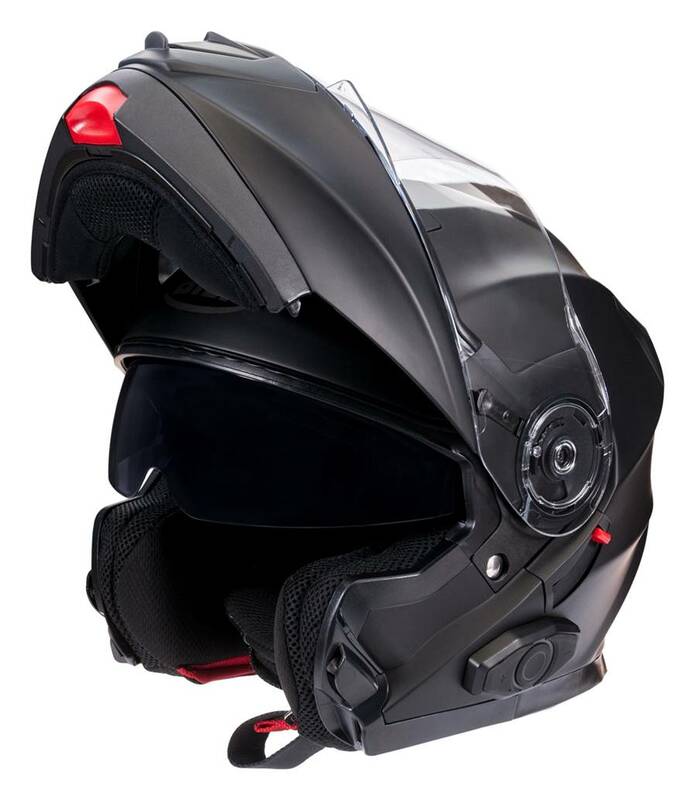 It features intercom function that is only workable with another ILM Bluetooth Helmet. The incoming phone calls override the intercom, music, FM radio and GPS navigation audio. It supports a maximum distance of up to 1000 feet between two riders that are using the intercom. The ILM Bluetooth Helmet meets or exceeds both ECE and DOT safety standards. Its DSP echo cancellation and noise suppression technology offers high quality voice communication. There are known issues with the Bluetooth System: when the helmet Bluetooth system hasn’t been used for a long time, the battery will enter deep sleep mode and during this time the Bluetooth mode may not be available. To wake the battery up, you need to charge the battery for about half an hour. After this charge, Bluetooth functionality will be restored. The Torc T14B Bluetooth Helmet is a motorcycle helmet with Bluetooth integrated shell. The integrated speakers allow the rider to enjoy music while riding. It delivers premium quality sound that is lacking a little at the low end but has enough volume output even for a loud bike. It also features a built-in mic that allows you to answer calls. You can control it through a Bluetooth knob that has been comfortably placed on the helmet. This Bluetooth motorcyle helmet is well-designed and good looking, including a flag graph in black color. It uses a dual density EPS system with intermediate oval profile and it features laser contoured comfort liner padding. It features an optically correct flat panel shield as well as a smooth lock drop-down visor system called Smooth Lock. The outer shell is made from advanced thermo polymer alloy that ensures both sturdy build quality and durability. The shell base profile is designed to incorporate from back to front with a neck brace. The Torc T41B holds firm to the head when strapped properly with minimal head shake. It also features fully removable and machine washable inner liner. In terms of protection and safety, this helmet is both ECE and DOT certified. 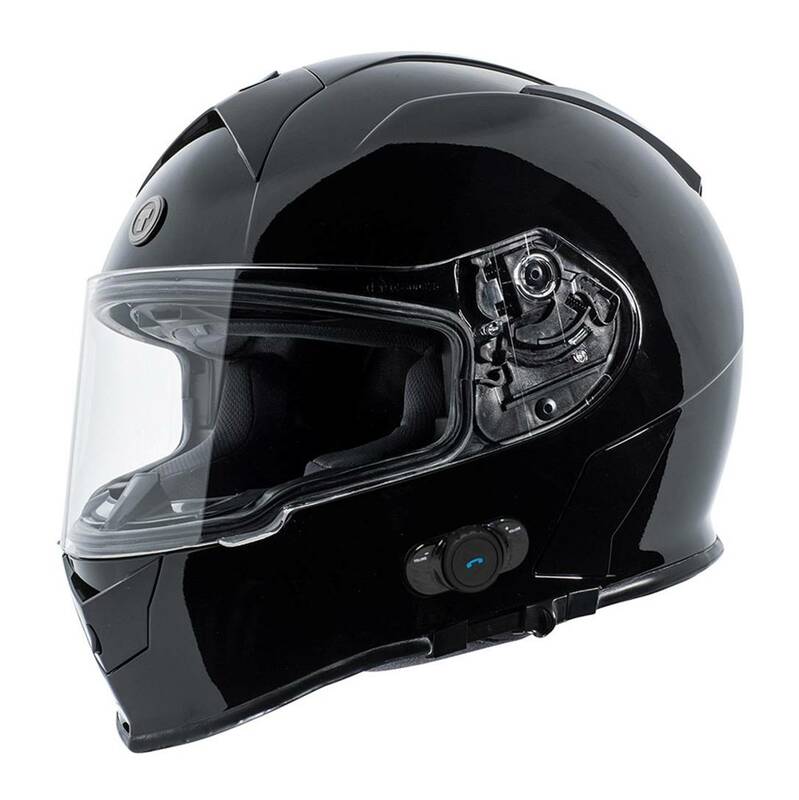 The FreedConn BM2-S is a Bluetooth motorcycle helmet that features integrated Bluetooth connectivity and communication capabilities. It is compliant with the Bluetooth 3.0, supporting HSP (Headset Profile), HFP (Hands Free Profile) and A2DP (Advance Audio Distribution Profile) for most of the Bluetooth devices. Once it is connected to the mobile phone and GPS, you can have a hands-free call and listen to the voice prompt of GPS easily. Similarly, you can connect it with mp3 and phones to enjoy your favorite music by controlling music through AVRCP (play and pause).The built-in Bluetooth intercom system keeps you in touch with up to two people from 500 m (1640 feet) away, making your communication convenient. Featuring Bluetooth 3.0 connectivity, the BM2-S helmet keeps you connected with your cellphone, music player and GPS system via Bluetooth easily and stably. It ensures comfortability with its ABS lightweight shell that has an advanced ventilation system. The design is user-friendly as a simple ‘one-button control’ can complete all operations such as receiving calls, making an intercom, turning FM and music on and off and GPS navigation when riding. The cheek pads and the liner of the helmet are deodorant, absorbent and removable, making them easy to clean. In terms of safety and protection, it meets and exceeds both DOT and ECE requirements. The FreedConn BM2-S is a motorcycle helmet that has integrated speakers and wireless connectivity, letting you listen to music or take calls while riding your bike. Its Bluetooth 3.0 technology keeps you connected with your cellphone, music player and GPS system easily and stably. The built-in ear speakers and noise canceling microphone allow bikers to receive GPS voice instructions, conduct calls on their mobile phone and listen to music on their MP3 player. In addition, this Bluetooth motorcycle helmet offers built-in bike to bike intercom communication for up to three people and up to 500 m (551 yards) away, so that you can always be in touch while riding. Its 600mAh battery offers up to 12 hours of talk time on the phone or up to 9 hours on the intercom. Its standby time is 120 hours. Comfortability is ensured through its ABS lightweight shell that incorporates an advanced ventilation system. Both the cheek pads and the liner are deodorant, absorbent and removable, making them easy to clean.In terms of security and protection, the FredConn BM2-S has a DOT certification, meeting and exceeding DOT requirements. The package includes a helmet bag, a USB charging cable and a user manual. The AC adapter is not included, but it can be charged by any mobile phone adapter. 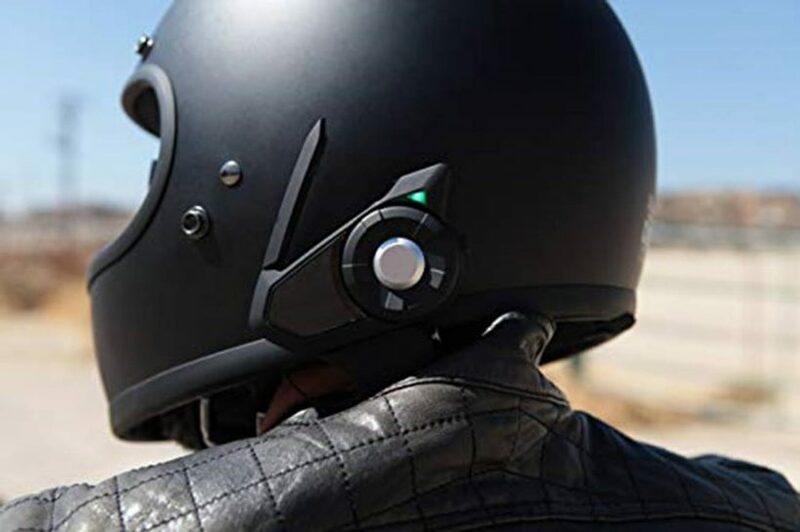 The O’Neal Commander Bluetooth Helmet is a motorcycle helmet with integrated speakers and microphone that incorporates communication capabilities. It features integrated FCC approved Bluetooth 2.0 technology and can be paired easily with your smart device. It offers 118 foot rider to rider intercom, GPS voice commands, call answering and rejecting through the built-in mic that provides noise-free communication. The built-in speakers deliver adequate volume output and you can use them to listen to music while riding. The incoming calls override intercom, music and navigation audio so that you can answer directly. It comes with a lithium-polymer battery that provides you with 10 hours of talk time and 130 hours of standby with a single charge. A power adapter is included in the package and replacement parts are available. The O’Neal Commander Bluetooth Helmet features modern looking and ergonomic design. It incorporates anti-scratch and anti-fog shield as well as a built-in drop-down sun visor, features that ensure both sturdy build quality and durability. The microfiber suede liner and cheek pads are removable and washable. The flow can be fully adjusted through the ventilation system and there is an integrated aerodynamic spoiler. A double D-ring chin strap with a retention system is incorporated, having an adjustable nylon chin strap with a secure snap. In terms of security and protection, this helmet has been both DOT and ECE approved. The TORC T27 is a full face modular helmet with integrated Bluetooth connectivity. With two built in speakers, up to 8 hours of continuous talk time and 150 hours of standby time, the T27B allows you to receive and send calls, listen to stereo music streaming from your MP3, phone, or FM radio, as well as listen clearly to GPS directions (Incoming cell calls automatically override other communications, but the new call reject feature can limit interruptions). The TORC T27 comes fully equipped with improved Bluetooth 2.0 technology to ensure compatibility with your Bluetooth enabled cell phone, android, or iPhone. It is possible to combine two or more BLINC enabled helmets, and enjoy communications from rider to passenger, and passenger to rider (intercom), or talk bike to bike (2-way communications within 100 feet). It checks in at nearly 20 percent less physical size than the model it replaces, thanks to advancements in EPS technology. It features significant intake venting and Venturi venting for the rear exhaust. The latching system for the front chin bar features a one button release mechanism and a sturdy slider based drop down visor mechanism has been incorporated. The front bar is fastened by stainless steel posts and a metal on metal locking system. The head form fit is an intermediate oval while the shell and chin are made from a thermoplastic alloy. The liner is fully removable and machine washable. 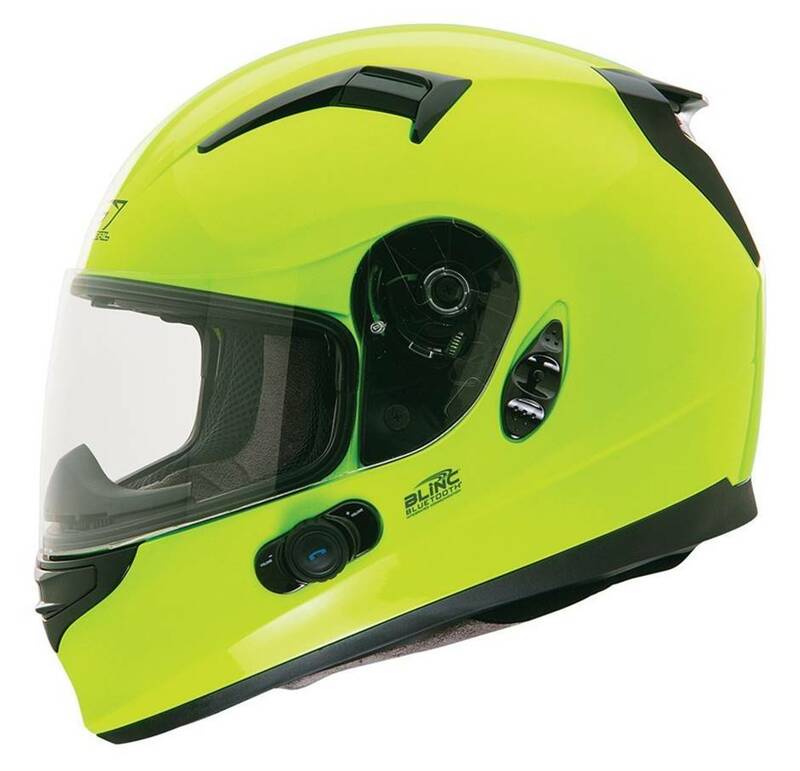 In addition to these features, this helmet includes a noise cancelling microphone, full duplex communications with DSP filter, self-adjusting volume, glove friendly and waterproof controls. The TORC T27 is both ECE and DOT certified. 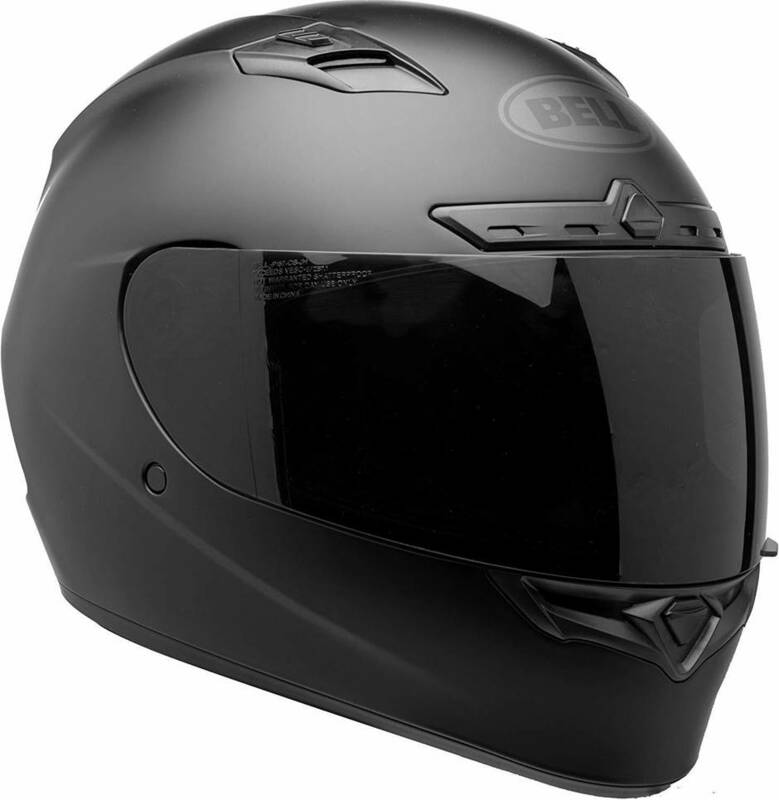 The Bilt Techno 2.0 Sena is a modular motorcycle helmet with integrated Bluetooth connectivity and communication capabilities. It features integrated speakers and a built-in microphone that allows you to listen to music or take calls while riding your bike. The phone call quality is very good without any audible noise and you can even listen to music while wearing this Bluetooth motorcycle helmet. The helmet delivers crisp and clear sound performance, lacking a little bit in the low end. The volume output is adequate with the exception of high speeds, where you might have difficulty hearing the music. It comes with a hi-tech injection molded polycarbonate shell that ensures robust build quality. Its modular design provides ease of use with an internal drop-down sun shield and a quick release clear locking shield that is fitted as standard. The Bilt Techno 2.0 Sena is suitable for warm climates as it incorporates a chin mounted airflow ventilation with open/close function that offers useful venting options. The lining is fully removable, adding to durability, and it features a chin deflector. Based on user reviews, it might be better to order one size bigger than yours as it is quite snug on the head. Its design is sleek and makes it good-looking, and it comes in matte black color. The Bell Qualifier DLX is a full-face motorcycle helmet that incorporates wireless Bluetooth connectivity as well as integrated speaker pockets. It accommodates the Bell Senna SMH10 and Card Scala Rider Q1/Q3 Bluetooth stereo headset and intercom, which allow your helmet to communicate with your Bluetooth-enabled device or another Bell Qualifier DLX helmet. The Bell Qualifier DLX comes in matte black color with no side logos for blackout effect and a dark smoke shield. The helmet ships with clear shield only and features an optional tinted shield. It features elegant and modern-looking design that makes it quite good-looking. The shell is made of lightweight polycarbonate which adds to durability. 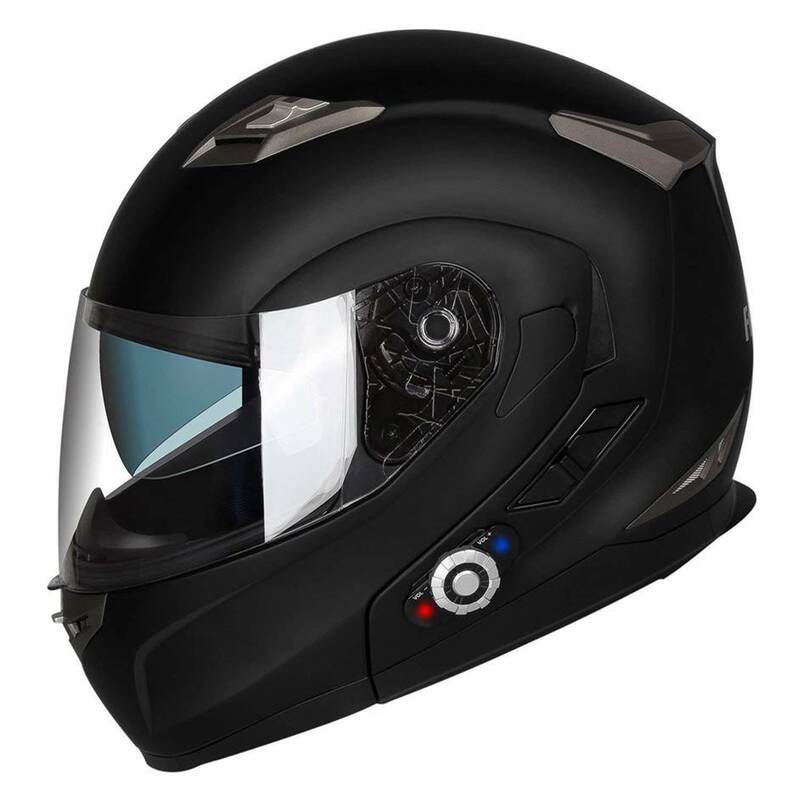 The DLX Bluetooth motorcycle helmet features an adjustable ventilation system for cooling and comfort. The latter is also achieved thanks to the contoured cheek pads. The padded wind collar drastically reduces wind and road noise. The interior is both removable and washable, adding to the helmet’s durability. We liked the fact that this helmet has an aerodynamic profile which resists buffeting and lift. The Bell Qualifier DLX incorporates click release for fast, easy, and tool-free shield changes. It also has NutraFog II anti-fog technology, anti-scratch and UV protected shield. The chin strap is padded with a D-ring closure. In terms of safety, this helmet has been DOT approved. The SMH10H-FM-01 is a Bluetooth stereo headset with long-range Bluetooth Intercom designed specifically for motorcycle half-helmets. With the SMH10H-FM-01, you can call hands-free on your Bluetooth mobile phone, listen to stereo music or voice instructions of GPS navigation by Bluetooth wirelessly, and have intercom conversations in full duplex with a passenger or other motorcycle riders. It also features a built-in FM radio to listen to your favorite stations in addition to intercom use. 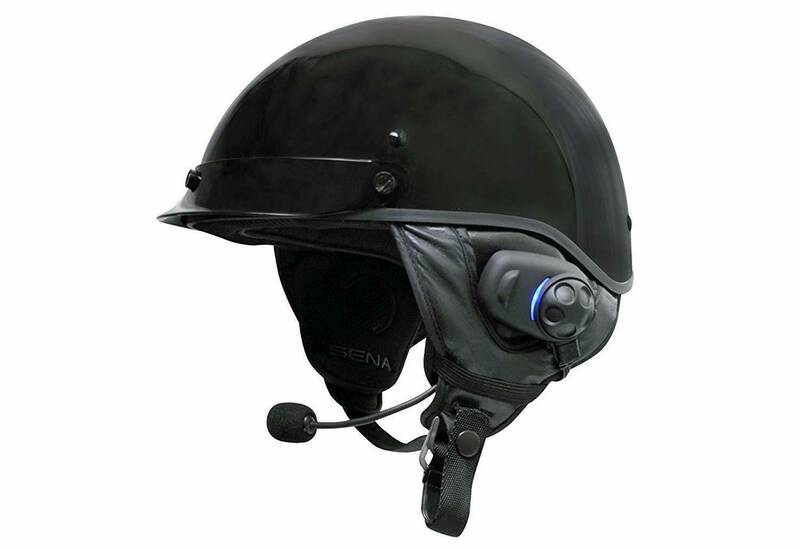 The Sena Bluetooth motorcycle helmet can wirelessly connect to other Bluetooth devices supporting HSP/HFP (Headset Profile/Hands Free Profile) and A2DP (Advance Audio Distribution Profile). Other Bluetooth features include Multi-Pair to allow intercom functionality for 4 people, and compatibility with certain motorcycle GPS systems. It features Bluetooth v3.0 and the advanced digital processing technology for crystal clear sound quality for both incoming and outgoing sound. 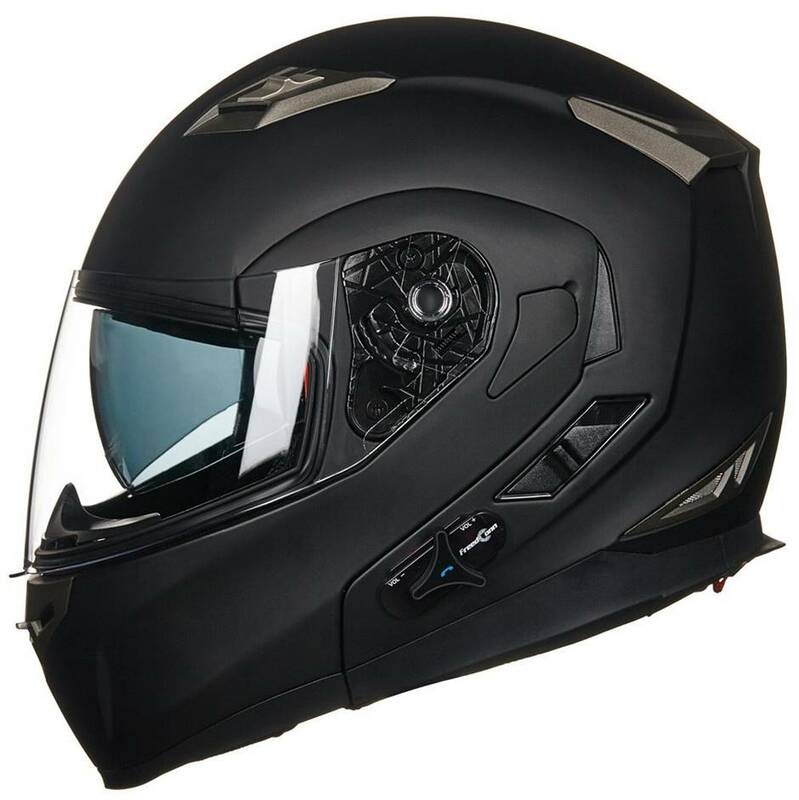 This helmet has a lightweight and compact form factor contributes higher performance for sports bike riding and makes it a suitable companion for motorcycle riders. The voice prompts allow riders to operate functions such as GPS, volume control, mobile phone calls and more without needing to take their hands off of the handle bars. This helmet provides voice prompt options for multi-language (English, French, German, Italian, and Spanish). You can easily decrease/increase the volume of the voice, music and intercom using Jog Dial. The SMH10H-FM-01 can save volume levels of previously connected profiles. The SMH10H-FM-01 will fit onto various types of helmets thanks to its standard clamp that is included in the package. The HJC CL-MAXBT II is a modular motorcycle helmet with integrated Bluetooth connectivity. It features integrated recess and interior speaker cavities that let you connect it with a Bluetooth-enabled device such as your smartphone or tablet. The exterior of the helmet has an advanced injection molded lightweight polycarbonate shell that ensures sturdy build quality. It features a single-button chin bar and face shield release that you can operate using only one hand. A snug and comfortable fit is ensured through its advanced CAD technology. 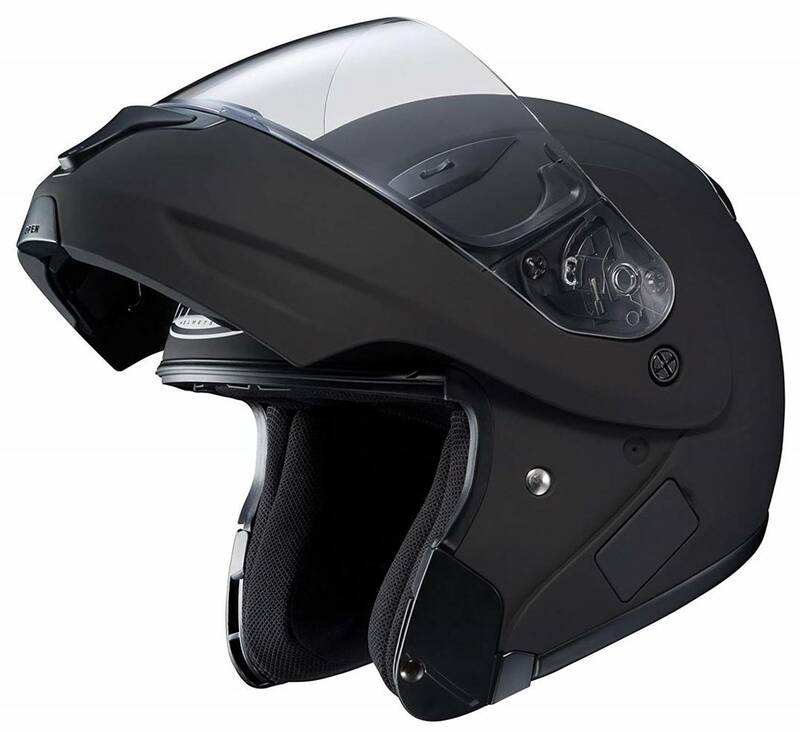 The HJC Bluetooth helmet has an optically superior face-shield which provides 95 percent U.V. protection. It comes with a QuickSlide tool-less shield replacement system (HJ-17) which is really fast and easy to use. 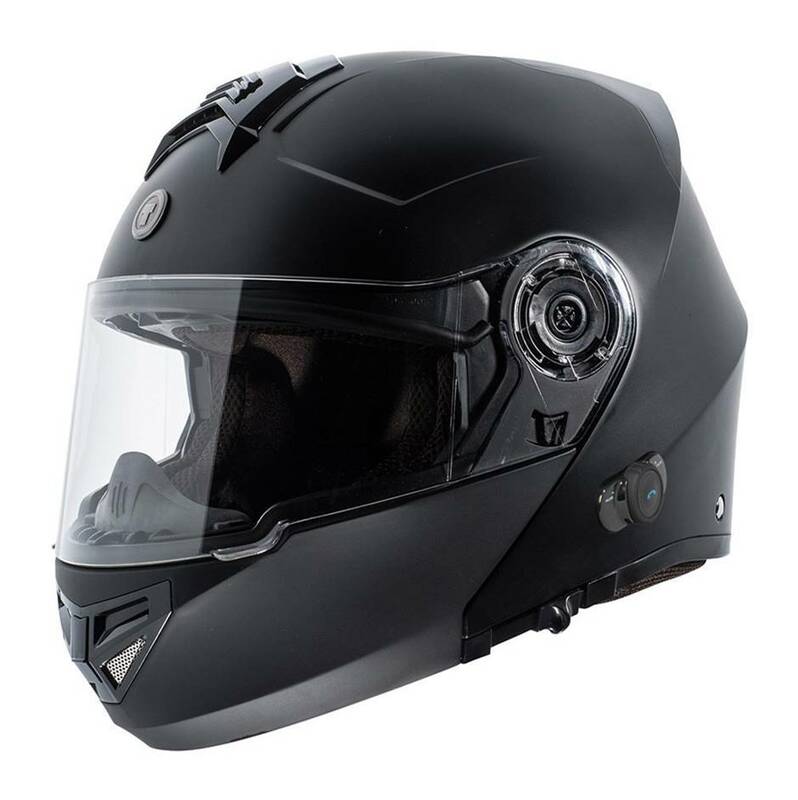 The helmet includes an ACS advanced channelling ventilation system which allows full front to back airflow and flushes the heat and humidity up and out. These features make the HJC CL-MAXBT suitable for warmer climates as well as long rides. The interior is moisture-wicking, removable and washable that adds to durability. The interior padding is comfortable, especially after a short break-in period for the cheek pads. It is made of bioceramic anti-bacterial Nylex. In terms of security and protection, the HJC CL-MAXBT meets or exceeds the D.O.T. standards.